As a sucker for colour, I'm excited that the neon trend is in full force this season -- the brighter, the better! 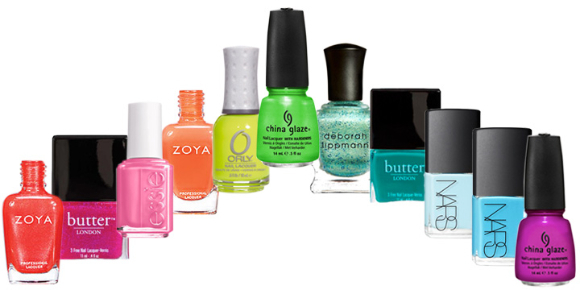 And especially on nails, it's a subtle sizzle to your overall look that is fresh, funky and just plain fun. As a kid, I remember painting my nails with really bright, fluorescent hues -- a highlighter yellow and hot pink -- and this cyclical trend brings me back to a more youthful time in my life. In warmer weather my nails are usually pretty bold, but this summer I can't wait to make an even bigger splash in these brilliantly vivid, candy-coated colours. Tip: Apply one coat of white polish under your neon hue to make the colour pop even more. L to R: Zoya 'Myrta' (US; Canada), Butter London 'Disco Biscuit' (US; Canada), Essie 'Off the Shoulder' (US; Canada), Zoya 'Arizona' (US; Canada), Orly 'Glowstick' (US; Canada), China Glaze 'I'm With the Lifeguard' (US; Canada), Deborah Lippmann 'Mermaid's Dreams' (US; Canada), Butter London 'Slapper' (US; Canada), NARS Thakoon 'Kutki' (US; Canada), NARS Thakoon 'Koliary' (US; Canada), China Glaze 'Beach Cruise-R' (US; Canada).